1. Preheat the broiler to high, while you pull all of your ingredients out of the pantry/fridge. Drain the tofu, and wrap in paper towels to completely dry. Set aside. 2. Place the poblano pepper under the broiler for approximately 5 minutes. You will want the pepper charred well. 3. Cool the pepper, and once cooled, remove the skin using a piece of aluminum foil. 4. Remove the stem and separate the seeds and ribs from the pepper. 5. Place the flesh of the roasted pepper in the food processor/blender. Add the chipotle peppers in adobo, green chiles, garlic, cumin, oregano, salt, 2 tbsp olive oil, and lime juice to the food processor/blender. Blend until you reach the desired consistency. If necessary, add a couple of teaspoons of water to thin. 6. Heat a large skillet or wok over medium-high flame. Add 1 tbsp of olive oil. 7. 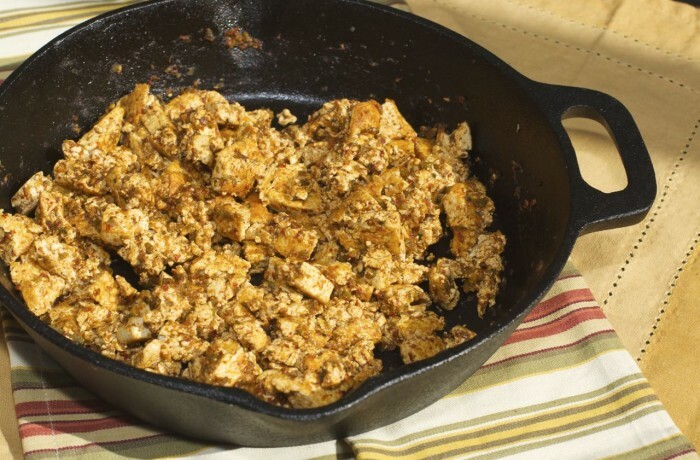 Slice the tofu into steaks and place them into the skillet or wok. Allow them to sear/brown on one side - approximately 4-5 minutes. 8. Flip the steaks and brown on the opposite site - approximately 3 minutes. Break up the tofu into small pieces and continue to cook for another few minutes. 9. Once cooked through, add the sauce from the food processor/blender. If you prefer a saucier dish, add all of the prepared sauce. If not, add the amount of sauce you wish to accompany your tofu. 10. Continue to cook through to allow the sauce to completely coat and cook with the tofu - another 3-4 minutes. 11. Turn off heat under skillet. When ready serve in burrito bowls, tacos, or even use in quesadillas. Great addition for burrito bowls include brown rice, sweet potato, spinach, black beans, shredded cheese and homemade salsa!